There will also be a breadcrumb that will show all associated entities. There will be two possible options you may see. Channel: This will show the channel the campaign is in. Source: This will show the specific source of the traffic. Offer: This will show the offer the campaign is associated to. Affiliate: Affiliate is your channel, and will show you the specific source as well. Offer: This will show the offer the campaign is associated with. Offer Contract: Offer Contracts are a variation of the original offer that uses the same conversion pixel. Depending on your settings, the Offer Contract can be changed at any time. Please review the Offer Contract documentation for more information. 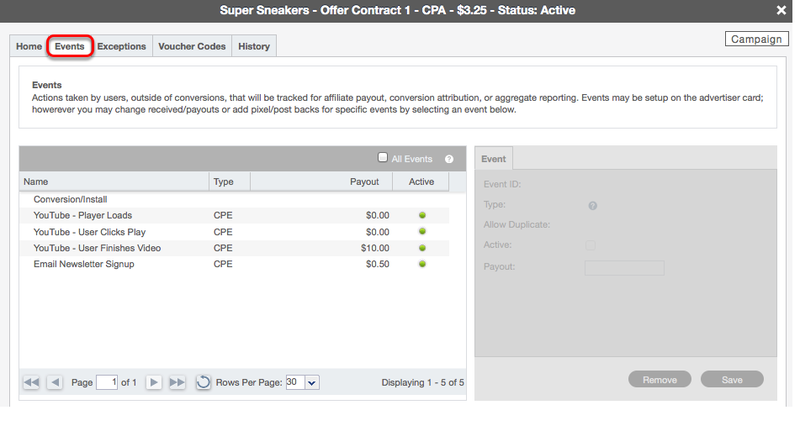 Payout: The payout field defines how much the affiliate is receiving per conversion (or per click if the Offer is a CPC). This can be changed at any time, and the change will be made in real-time. Status: The status can be changed at any time. The affiliate's traffic will be redirected if their status changes from Active to Inactive or Pending. Paid Redirects: By default, this feature is enabled. In an offer or vertical redirect situation, CAKE will auto create a campaign for the affiliate if one does not exist for the offer. If the redirect results in a conversion, the affiliate will receive payment. This can be unchecked at any time. 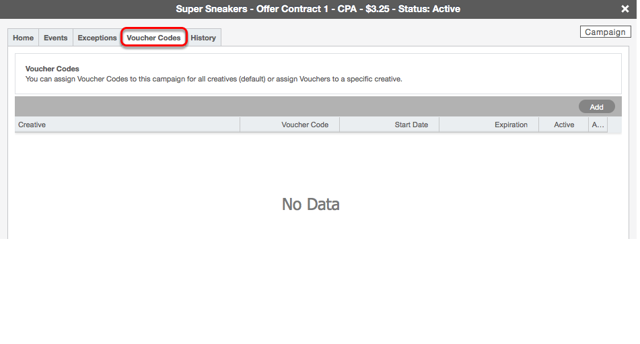 Click Cap: This feature functions the same as the click cap on the Offer card. The largest number of clicks allowed for this campaign should be added here. Click Cap Interval: From this drop down, you are selecting the interval for which you are setting the click cap: Daily, Weekly, Monthly or Custom. Send Alert Only (No Redirect): Having this checkbox checked will send you an alert if the click cap has been hit and not redirect any further traffic. 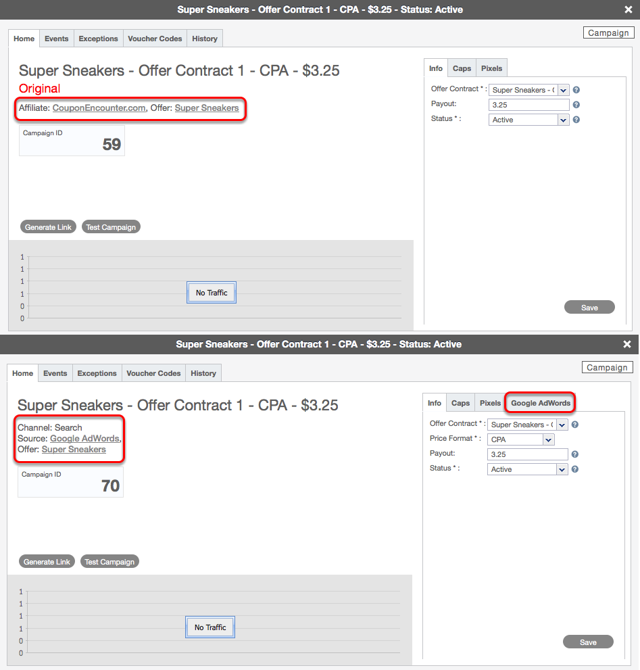 Conversion Cap: This feature functions the same as the Conversion Cap on the Offer card. The largest number of conversions allowed for this campaign should be added here. 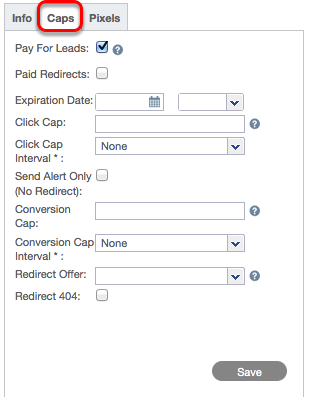 Conversion Cap Interval: From this drop down, you are selecting the interval for which you are setting the conversion cap: Daily, Weekly, Monthly or Custom. Send Alert Only (No Redirect): Having this checkbox checked will send you an alert if the conversion cap has been hit and not redirect any further traffic. Redirect Offer: A Redirect Offer can be set at the campaign level. This redirect takes precedence over all other redirects. 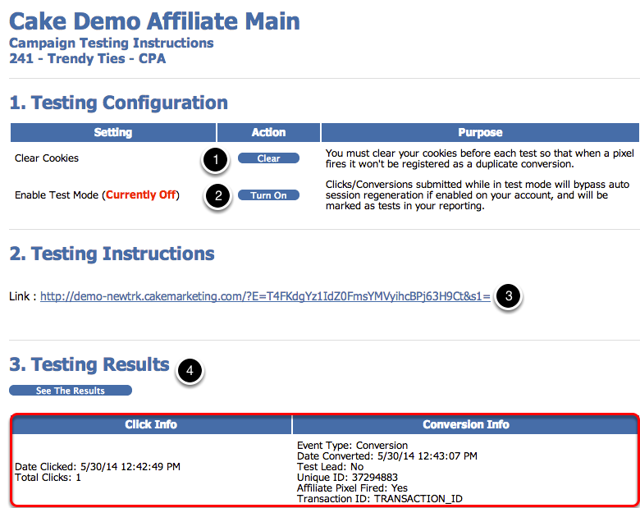 Pixel: This is where a user can place their affiliate's conversion pixel. Multiple browser pixels can be placed in this text box. CAKE will inform a user that the pixel "Must be HTTPS" if the SSL feature is enabled on the offer. 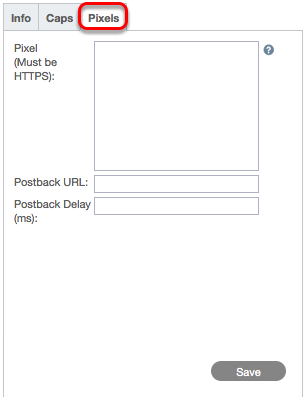 Postback URL: This is where a user can place their affiliate's server pixel (postback url). Only one pixel can be placed here. Postback Delay (ms): Allows a user to specify, in milliseconds, the time between firing a pixel in the Pixel field and the Postback URL Pixel. 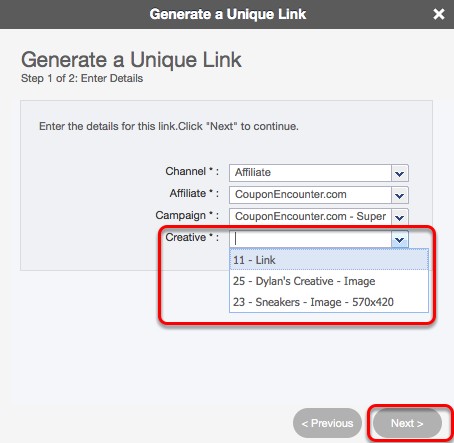 Clicking on the Generate Link button will allow you to create a unique link for this affiliate's campaign. The affiliate and campaign will auto populate. You will want to select the creative you wish to generate a tracking link for. On step 2, the link will be displayed next to 'Unique Link'. The link is composed of your tracking domain, the affiliate's ID, and the creative ID. Clicking the Test Campaign button will open a new browser window where you can test the campaign to ensure the conversion pixel is placed properly and that CAKE is tracking a click and conversion. 4. Clicking the See The Results button displays the click and conversion information. This will show you a date and time stamp for both your click and conversion and will also alert you to wether or not your affiliate's pixel fired as well. Events is not enabled by default. If Events is enabled, the Events tab will display all events that have been set for the offer. From here, you can make specific edits for this campaign. For more information on the Events tab and the feature as a whole please see the Events document. 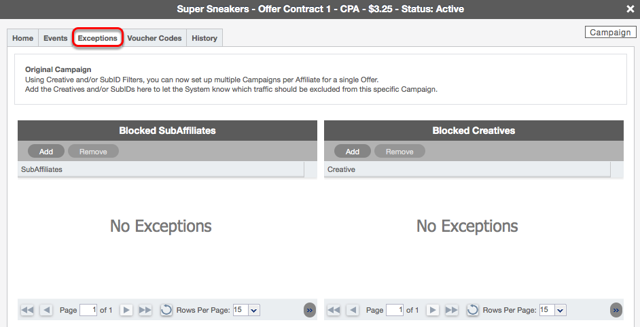 The Exceptions tab allows a user to block either subaffiliates or creatives. 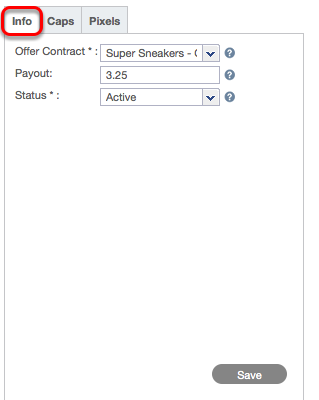 Blocked Subaffiliates: This widget allows a user to either add or remove subIDs. Traffic to the campaign with a value in the s1parameter of the unique link that matches a value in this widget will redirect to the global redirect. 2. Type the subID. CAKE will reference any subIDs listed for the affiliate. 3. Choose the subID from the list and click update. Blocked Creatives: This widget allows a user to either add or remove creatives. Traffic to the campaign with a value in the c parameter of the unique link that matches a value in this widget will redirect to the global redirect. 2. The drop down will contain all creatives specific to the offer for the campaign. 3. Choose the creative from the list and click update. The Voucher Codes tab allows you to assign specific voucher codes to this campaign. The History tab contains an audit trail of all activity pertaining to this campaign. Similar to all History tabs, this section also allows for notes to be saved which are searchable.